Saskatoon's Andrea Menard spent 10 days aboard the Polar Prince as it navigated the St. Lawrence River during leg 2 of its five-month trip. Saskatoon's Andrea Menard says she'll take a lot away from her time aboard the Canada C3 expedition making its way around Canada by ship. The Mé​tis singer and actor spent 10 days aboard the Polar Prince as it navigated the St. Lawrence River during leg 2 of its five-month trip. The 150-day trip around the country's three coasts, from Toronto to Victoria, is aimed at inspiring a deeper understanding of the land and the people of Canada. Each leg of the trip will host a diverse group of elders, youth, scientists, artists and writers, non-Indigenous and Indigenous, from across Canada. 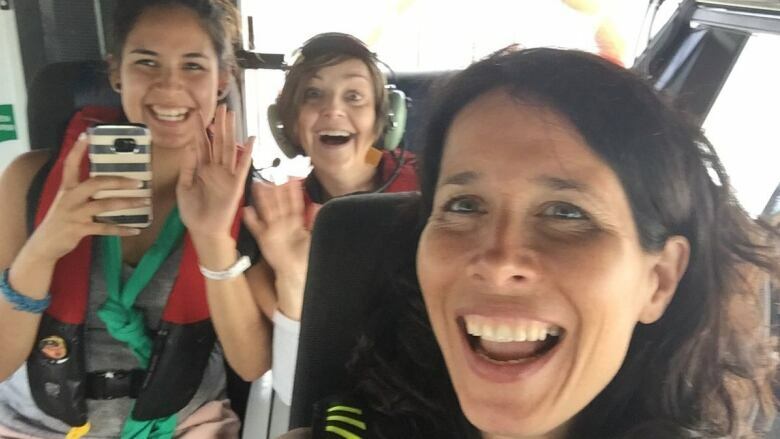 As one of four Indigenous people aboard during leg 2, Menard told CBC Radio's Saskatchewan Weekend she had concerns about being part of a Canada 150 signature event. "We had to be honest with ourselves and all of us came forward and said we were nervous about being part of a Canada 150 event because we didn't know how our own people would feel and whether this would be something we would be mocked for." She said the fact that many of the non-Indigenous people aboard on her leg said it hadn't occurred to them that Indigenous people may take issue with celebrating Canada's 150th birthday was reason enough to take part. If she and the other three Indigenous people on board during leg 2 hadn't gone, "we would have missed out on educating a whole new group of people," she said. By being part of such a diverse group of Canadians, "We realize how much we really don't know about each other," she said. She said many Indigenous people believe that a lot of non-Indigenous Canadians know about historical injustices and just don't care. "We need to awaken to the fact that the main culture and most Canadians actually don't know the history," she said. "And when that awakening happens, we'll realize that it's not that people are just cruel and they don't care, because that's a terrible thing to think about the main culture. So we both need to awaken to some things we don't know." She said she's taken on the task of "awakening" Indigenous and non-Indigenous people to what information they're missing from each other's community. "Humans are good and I'm sticking to that," she said with a laugh. During her 10 days aboard the ship, they travelled along the St. Lawrence River, visiting towns, research facilities and reserves, such as the Mohawk community of Kahnawake which took part in blockades during the Oka Crisis in 1990. "The best part for me was when we went to Kahnawake, and people from all across Canada who had heard of Oka were actually on the land talking to the people," she said. "One of our participants, Tiio Horn, was actually from there and we got to experience and see true reconciliation. Through tears and discussion we recognized we still had a long way to go but every tear and every conversation is helping towards reconciliation." The ship's journey is currently on leg 4, and arrives in Halifax on Monday. It will continue on north past Newfoundland, Labrador and Baffin Island before entering the Northwest Passage. Then it will sail around Alaska and down the B.C. coast to arrive in Victoria in late October.